Mentorship has never felt quite right to me. At least not in the traditional construct of formal mentorship programs. In many respects, traditional mentorship programs suggest a power dynamic that doesn’t resonate for me. They have always felt contrived and forced. And let’s be real, traditional mentorship programs aren’t a realistic commitment for many of us. Jen forever changed my approach to mentorship by introducing the concept of “Mentorship Moments”. Mentorship is all around us. 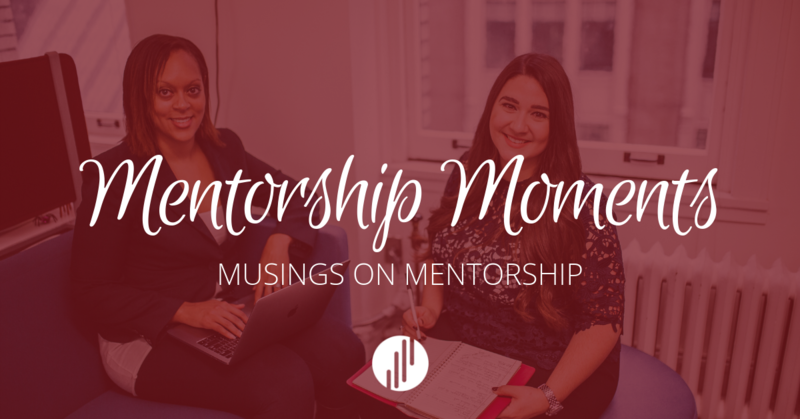 My foundational concept of mentorship moments is that they can be anything – unintentional and raw, or structured and sought out. When we are receptive, we can experience mentorship moments with people across all backgrounds, industries, professions, seniority levels, and more. Some of my most profound mentorship moments have come from people at all levels of their career – from founders and executives to peers and students. For example, this summer I chatted culture with Jennifer Parente, which inspired me to share my thoughts about workplace culture. Entrepreneurship is a constant journey in humility. I am constantly reminded about how much I don’t know. “My way” is rarely (read: never) the best way, and I am always learning the hard way by making mistakes (literally every day). My favourite analogy is that I am in a dark room, seeking to turn on as many lights as possible through knowledge. Perpetual curiosity and a relentless pursuit of knowledge has been a game changer. We are all a product of our lived experiences. Do yourself a favour: be open to mentorship moments. Especially where you least expect them. What are some of your most profound mentorship moments?